This sweet rice dessert is more commonly known as Kapampangan Kapit or Kulambo in Pangasinan, or simply Kalamay in most other regions. The sweet rice flour is mixed with coconut milk and sugar and stirred to come together. What you get is like a blob of sticky paste(not quite an appetizing description, I know) and this is the stage where you add the coconut oil from the latik to keep from sticking. This may look cooked after 5 minutes, but try to keep cooking on the low heat for at least 10-15 minutes so the flour is cooked thoroughly. 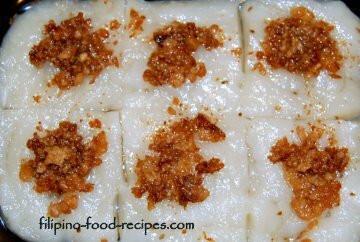 Minus the latik and anise seed, this one resembles the texture and taste of the cooked Chinese Tikoy. 2 Mix the flour, coconut milk and sugar, then strain. Add the anise seed. 3 Place the mixture on a non-stick skillet and stir until they come together, about 5 minutes. 4 Turn the heat to low, and add a couple tablespoons coconut oil from the latik. 5 Flatten to 1/4 inch thick and turn or flip over repeatedly every 3-4 minutes, cooking for a total of about 15 minutes. 6 Set on an oiled banana leaf, cut in serving sizes and top with latik. Use a non-stick teflon pan for easier cooking and handling. The recipe starts off as a thick liquid rather than runny so the mix comes together right away during cooking, thus cutting the mixing time in the pan. I use kitchen shears or scissors to cut the kalamay in serving sizes, so much easier than using a knife. Try not to use too much coconut oil so your kapit is not too greasy. Cook on low heat up to 12-15 minutes once the cake comes together to cook the flour thoroughly and to keep the cake from spoilage. A variation of this recipe is by cutting the cake in cubes and serving in simple sugar syrup. For recipe, check out the recipe here.